Jmathlib is meant to be a clone of matlab, but written entirely in java. A library of mathematical functions designed to be used in evaluating complex expressions and display the results graphically. It will be used either interactively through a terminal like window or to interpret script files. It can be extended very simply with m-files an java classes. 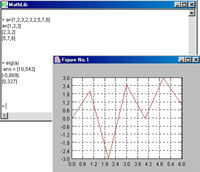 It is intended to be a java version of programs such as matlab, octave, freemat and scilab. JMathLib is a development program that works under windows xp, windows vista and windows 7. It supports both 32-bit & 64-bit windows editions, therefore it could run faster on 64-bit computers. It is Free so you can download it and share it with your friends. Estimated download time for JMathLib on a common adsl connection is less than a minute. Version 0.9.4 was released three thousand seven hundred eight days ago by JMathLib. Click the green download button to download it now.